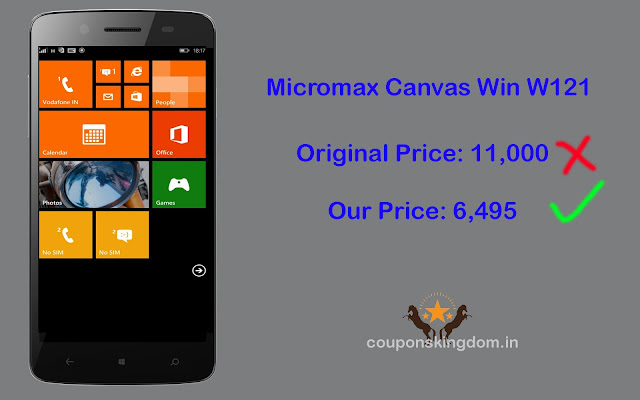 Micromax Canvas win w 121 windows mobile original price is Rs.11,000 but in this sale we offer this mobile for just Rs.6495. Buy this mobile with EMI option which starts at rupees 580 per month. Cash on delivery is available with this mobile. Buy this mobile at Amazon India from us (couponskingdom.in) and get extra 1% cash back from us, see about us section for cash back offer details. Micromax Canvas win w 121 has an 8 pixel Mega primary camera with LED flash and 2 megapixel front facing camera for selfies. The camera has auto adjust and auto focus modes so taking pics on the go is very easy. Micromax Canvas win w 121 has a 5 inch HD capacitive touchscreen with 1280 x 720 pixel resolution, it also supports 16.7 M colours support, with this mobile gaming and movie viewing experience is so fun. Playing games and stream videos with high speed is made easy by Micromax Canvas win w 121 as it is powered by 1.2 gigahertz Qualcomm Snapdragon Quad Core processor and Windows 8.1 operating system. Store huge amount of data in Micromax Canvas win w 121 as it has an internal storage of 4.29 GB and it can be extended up to 32GB also with 1GB RAM which boost your applications, the mobile also has dual sim slots (GSM + GSM). The mobile is powered by 2000mAH battery providing talk time of 8 hours and standby time of 150 hours. Microsoft Canvas win w121 comes with 1 year manufacturer warranty for device and 6 month manufacturer warranty for inbox accessories including batteries from the date of purchase. The mobile works very fast compared to any other Android mobiles and it is so stylish, there is no zooming option for camera but with autofocus the pics which are clicked can be zoomed without any bluring.